Look at the words possible and impossible. With only the addition of 2 extra letter the take on means that are literally poles apart. The definition of impossible is ' not possible, not able to be' in other words give up you can't do it. This may well be the dictionary definition but it is a word that was simply not in the vocabulary of Einstein, Fleming etc. If they came across something that was deemed impossible they simply deconstructed it and did it a different way. The impossible became the possible simply by looking at it a different way, these business ecards are the perfect way of getting that message across to somebody who feels they have come across and insurmountable obstacle which has rendered their task seemingly impossible. If this is somebody you know through work you can let them know that you believe in them by sending these Lots of Possibilities ecards. The message couldn't be simple. 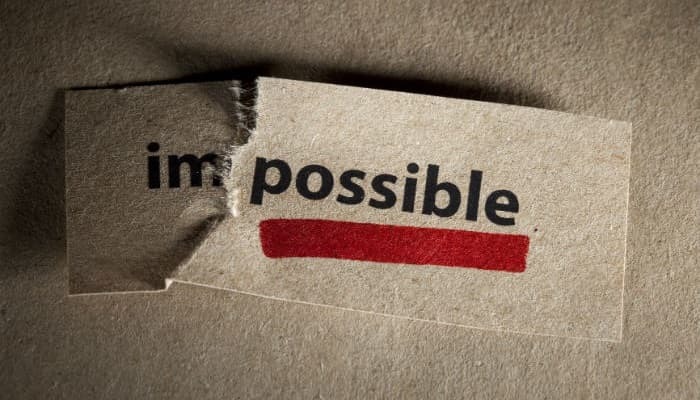 The word impossible is written on a piece of paper, but it is torn after the M and the rest of the word boldly underlined in red. You can also add your own message to let them know things are only impossible if they allow them to be. We would love to show what a great impact we could have on your holiday season marketing with our amazing business holiday ecards.